A 95-year-old Kent woman has had to get to grips with a new vacuum cleaner - after her original vacuum finally gave up after more than 70 years' service. Former bed-and-breakfast keeper Edith Kingsland, from Romney Marsh, bought the cleaner as a present for her mother in the 1930s. The cleaner recently blew up in the middle of cleaning - but its makers Electrolux have given her a new model. The only problem, Mrs Kingsland said, is the new model is too big and heavy. 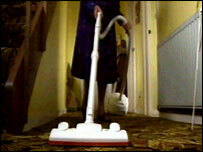 After she married, she and her late husband Godfrey used the vacuum to clean their bed and breakfast and hotel. Mrs Kingsland still does some of her own housework. "It's very quiet, very efficient - too heavy for me, and too big for my cupboard," she said.